North Kivu (French: Nord-Kivu) is a province bordering Lake Kivu in the eastern Democratic Republic of the Congo. Its capital is Goma. North Kivu borders the provinces of Ituri to the north, Tshopo to the northwest, Maniema to the southwest, and South Kivu to the south. To the east it borders the countries of Uganda and Rwanda. 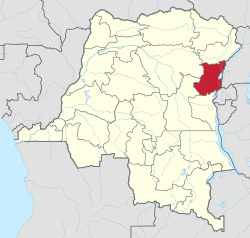 North Kivu was formerly a "sub-region" in the region of Kivu. The region was the scene of much fighting during the Second Congo War (1998–2003), and the Kivu conflict (2004–present). Laurent Nkunda was offered the rank of Brigadier General and command of the new Congo Government's FARDC Eighth Military Region, covering North Kivu, by DRC government decree 019/2003 of 19 August 2003. However, he refused to take up the post. On 26 May 2004, General Obed Wibasira (RCD-Goma) was named to the position. However, Wibasira was suspected of complicity with the soldiers in Goma who triggered a mutiny in Bukavu in February 2004, and on 23 January 2005 he was switched with Gabriel Amisi Kumba, at the time commander of the Fifth Military Region in Kasaï-Oriental. Gabriel Amisi Kumba was named as a Brigadier General when taking up the post. General Louis Ngizo, a former commander of the Rally for Congolese Democracy, was appointed commander in November 2006. However he was of little influence compared to powerful military figures from Kinshasa, U.S. diplomats said in comments released via WikiLeaks. Brigadier General Vainqueur Mayala was transferred from command of the Ituri operational zone, promoted to Major General, and appointed military region commander in May 2007. Ngizo left Goma on 13 May 2007, his next posting not being known at the time. During late 2008, the FARDC maintained its dismal record in combat against Laurent Nkunda's CNDP faction, losing the Rumangabo military camp to the rebels. The dissident Mai-Mai 85th Brigade, commanded by Colonel Samy Matumo, controlled the cassiterite mine at Bisie, just north of Manoire in Walikale, in the south-east of North Kivu. The former RCD-K/ML also has fighters in the province; 'at the beginning of the transition [2002-3] the RCD-Mouvement de Libération president declared he had 8-10,000 Armée Patriotic Congolaise (APC) troops in the Beni-Lubero area of North Kivu.’ This exaggerated figure now seems to have been reduced to ‘several thousand’ (2-4,000?) as of early 2006 following demobilizations and men joining the integrated brigades. The Beni massacre occurred in the province. In October 2007, the United Nations High Commissioner for Refugees (UNHCR) warned of an increasing number of internally displaced people (IDP) in North Kivu related to the fighting there between the government army, the Democratic Forces for the Liberation of Rwanda (FDLR) rebels and renegade troops, including Laurent Nkunda's forces, and a build-up of military supplies and forces, including the reported recruitment of child soldiers by armed groups across North Kivu. 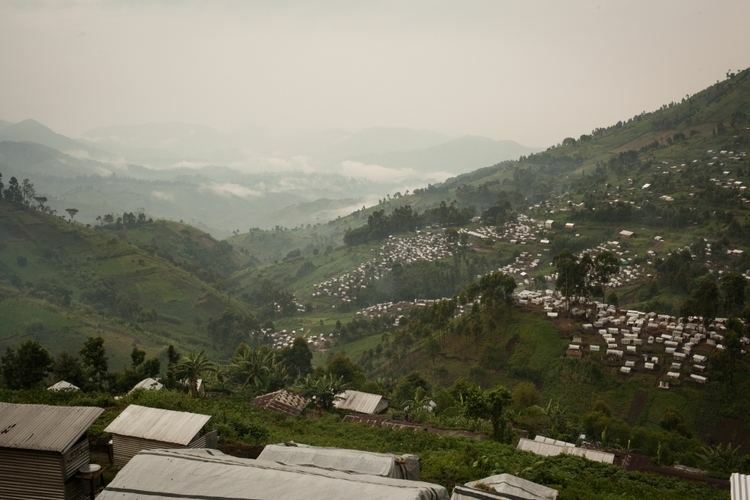 The UNHCR thought that there were over 370,000 people in North Kivu displaced since December 2006, and is expanding its camps in the Mugunga area where over 80,000 IDPs were estimated. The brief capture of Goma, by M23 rebels caused "tens of thousands" of refugees. The town of Sake was abandoned.